Ojey (let’s call him in this way) grew up in a difficult time for Northern Uganda. Civil war terrorized the population and, especially at night, rural areas were hostage to violence and kidnappings. Children and teenagers were plagued by nightmares every time there was news of another kidnapping. Every night hundreds of them traveled from their Acholi villages, carrying their knapsacks, in search of safer sleeping quarters in the crowded streets of Gulu. Ojey was seven years old. He lived on the outskirts of Gulu with his family and did not need to move around at night. Or at least that is what he thought until one night the rebels broke into his house and killed his parents. Ojey does not talk much about what happened that night; for several years he clammed up. The fact is that the child finds himself alone. He wanders around the streets of Gulu and does what he can to survive. He joins other children and young people who live in the streets. out of curiosity. But everyone there is kind to him. He enjoys stopping by, observing what goes on, staying on to read and write. At the School of Peace he becomes a loyal attendee, always punctual. He even gets to know the Italian friends of Sant’Egidio and writes to them often. His English improves with every letter and his words and thoughts get clearer and clearer, as if they came from an obscure, dark past and looked ahead to a brighter future. Thanks to the help he received through Sant’Egidio’s program of long distance adoption Ojey was able to begin his studies He achieved significant progress. He had a lot to catch up on but he was very dedicated. He dedicates the rest of his free time to his great passion, football; he is a Chelsea fan although during the world Cup Ojey always routes for Italy. But most of all there is the possibility of a different future. 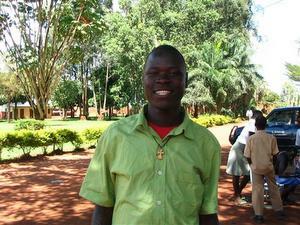 Soon Ojey will enroll in a professional school to become a mechanic.